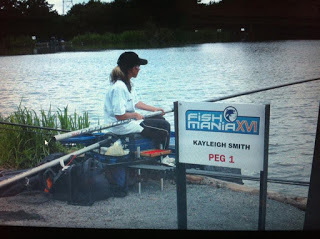 My latest interview is with England and Matrix star, Kayleigh Smith. Firstly, wow, what a year you’re having, Ladies Fish O Mania champion, Division 2 National Winner and represented England – phew! What’s next? Kayleigh – Yes it’s definitely been a good year for me. Next up is the Winter League with Ossett, so hopefully we will be able to qualify for the Winter League final again and probably a few open matches/leagues at Lindholme and on the Stanie. 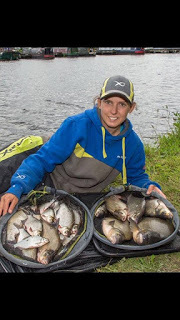 I’ve already qualified for next year’s Ladies Fish’O on the last Ladies National, so I will be trying to retain my title, while trying to qualify for one of the big money finals in 2018. Can you tell us how you got into fishing and what was your first fish? I first got into fishing by walking my dog around a local quarry where a few of my friends went fishing. I was bought a setup from Argos and during the summer holidays I would go every day to the tackle shop for a pint of maggots, I caught my first fish here which was a roach. The Leeds juniors were run from the tackle shop so I got asked if I wanted to join their team. I did and that’s how I progressed into match fishing and never looked back. 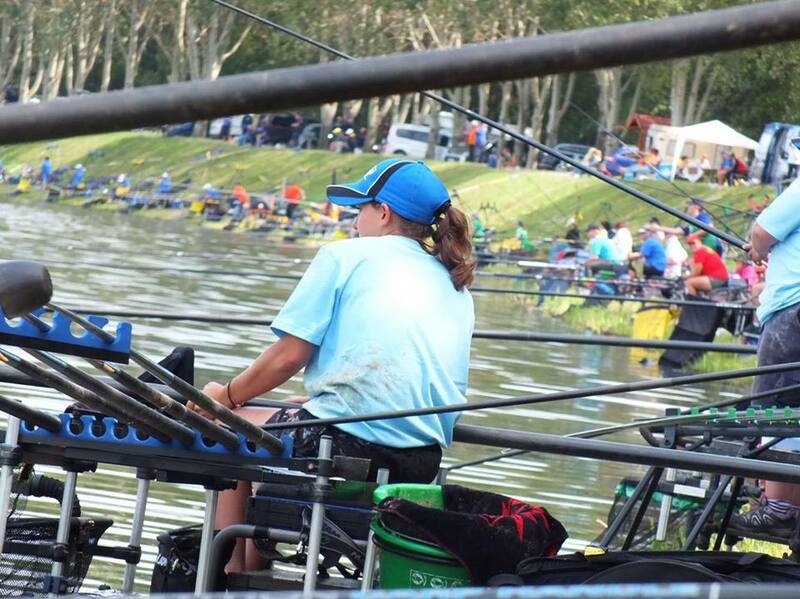 Match angling is still very much a male dominated sport, do you encounter much in the way of chauvinism or patronising attitudes? No, very much the opposite. Most people are very nice and are willing to share information. It does help however if you are able to join in the banter that takes place and learn to give as much as you get. It’s all part of having fun and enjoying the day out, nothing too serious. You’re a consultant with Matrix, how much do you get involved with the development of new products and can you tell us a little about the process from concept to the product hitting the shops? The new SX Slim rods are a very nice silver fish/skimmer rod that I have had the pleasure of using, I generally get to help out in testing the new products, making some of the product videos which you may see on Facebook and Youtube. In terms of product development Matrix have a team dedicated to this, although any ideas/changes we may have, we can put forward for future products. What exciting new Matrix products can you tell us about? There are quite a lot of new products, which have just this week been released so make sure you check them out, they’re all on the Matrix website now. It’s a toss up between fishing for roach on hemp and big carp down the edge. Tommy Pickering was the one who introduced me into international fishing and also taught me a thing or two along the way and is someone I still look up to now. I see you also do a bit of specimen hunting, what’s your biggest fish in the UK? And abroad? Yes I like to do a bit of carp fishing in the summer, I generally try to go 2/3 times a year and make all my rigs and hooklengths for the world champs. 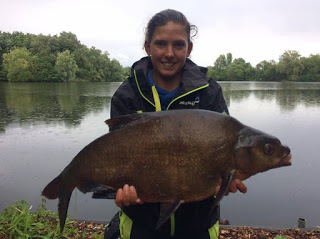 My biggest UK fish at present is a 25lb ghost carp caught from Pool Bridge Farm and I’ve had bream to 13lb, I’m hoping to catch a UK 30lb next year. 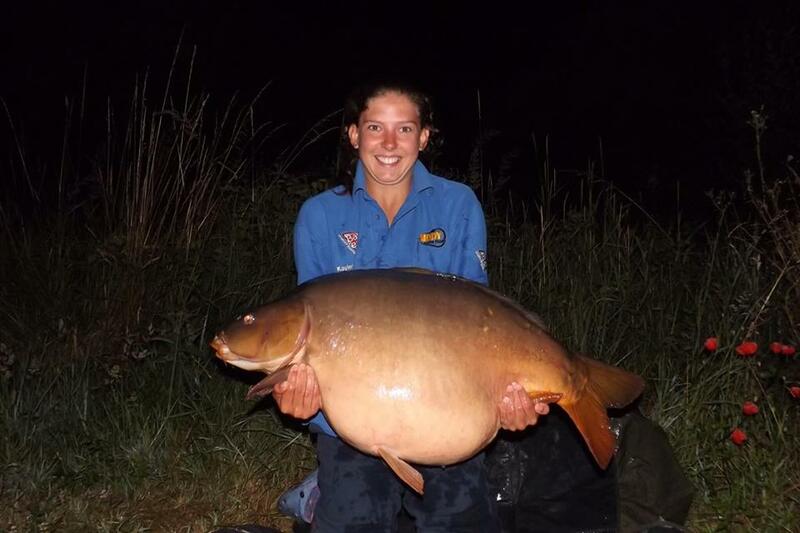 My biggest fish abroad is a 51lb mirror carp caught from Crete Lakes in France. 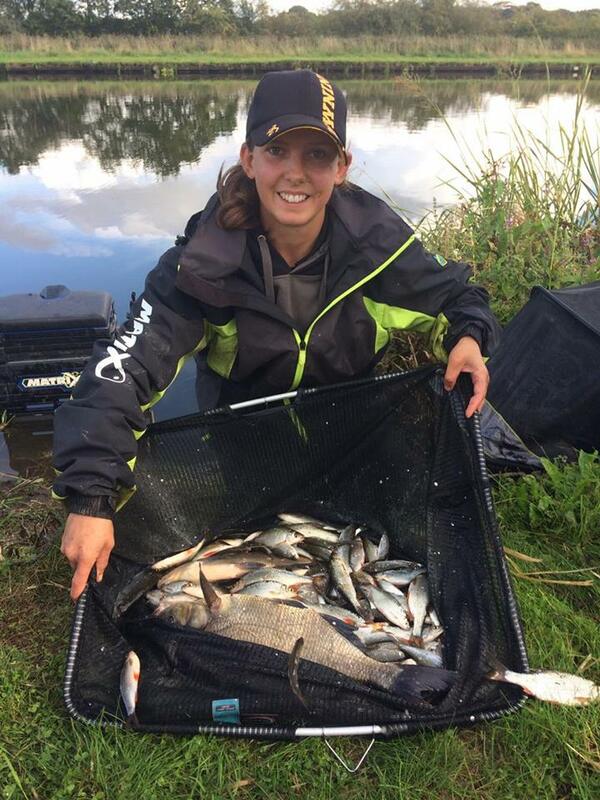 Your partner is also a match angler, how competitive do you get or do you work together and pool ideas? Is there a cheeky pound side bet when you fish the same matches? And if so who’s got the bragging rights so far this year? We are quite competitive but we generally don’t have any pound side bets, we just share all our money. We normally try to help each other where we can. So far it’s a close one between us as one of us has picked up at least once every weekend except for 3 so far this year. Overall though I reckon I might have edged it this year 😉. I have won the Ladies Fish O, the Division 2 National with Ossett as well as representing the England Ladies in Hungary along with open matches. Adam won the Bait Tech Winter League Final on the Stainforth and Keadby Canal and the DHP Memorial along with framing in quite a few opens. I think there will continue to be split opinions on this. I feel that there will always be commercials, with some people seeing no need to fish the rivers or canals, but on the other hand some people just want to fish canals and rivers and don’t want to fish a commercial. I personally enjoy both at different times of the year. Canals in winter and commercials in summer, getting the best of both worlds, and it generally keeps bites coming all year round. On the whole, match angling is an aging sport (present company excluded of course!) any ideas on how we can get more youngsters into the sport? When I was younger junior clubs and competitions were very popular and a great way to fish against people your own age, but they seem to be dwindling. I think that possibly running more junior leagues and coaching days and encouraging parents to bring them along to fish is one way to increase numbers. I would go back to my first Fish’O final, quite a few years ago now and I was 2nd to Sandra (Scotthorne). Back then the matches were only 3 hours long not 4. I had 12kg and Sandra had 22kg. I was on ‘The Peg’ but it was 10ft deep. I was fishing a too light of float and kept foul hooking barbel as I was feeding meat through a kinder pot. With 1 hour to go I put a new heavier rig on and started big potting meat. I got a fish a chuck until the end. Lack of experience cost me the match and I was sure if I had fished it like that from the beginning, I would have won the match, but you only learn from your mistakes. Feeding little and often is definitely a better method of feeding rather than just dumping in a load of bait and waiting, especially now it’s starting to get a bit colder. I personally don’t think that match fishing alone will ever be able to become a full time career as there are so many variables that are out of our control and no matter how much time and effort goes in sometimes it’s impossible to get a result from some pegs. However I think it will be possible to make a career from the sport but only through working for companies. 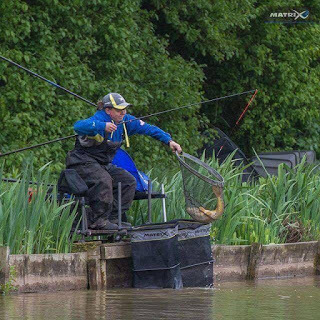 The fact that more and more big money matches are available now is a massive positive for match fishing though and hopefully it will continue to grow in the future. Yes I enter some of the qualifiers each year, I don’t travel up and down the country like some people, I generally try to do the local ones but with more and more big matches being created it still gives you a lot to go at. I would love just to qualify for one of these events, let alone win one.